Family nightshade family. There are many types of pepper which differ in a big variety of forms, the sizes of fruits and use. In kitchen gardens two unlike groups of grades of pepper are cultivated: vegetable (sweet) pepper and bitter (spicy) pepper, sometimes consider them even as separate cultures. In sweet pepper very high content of vitamin C is, more, than in a citrus that does it by the most valuable dietary product. Bitter pepper is used as seasoning and also in the medicinal purposes in a type of tinctures (most often spirit), however in view of its sharpness and ability to render irritant action on mucous membranes of a stomach at some diseases it, on the contrary, it is impossible to use including as seasoning. Also its infusions can be used for protection of other garden cultures against wreckers. For record: some grades of hot pepper are considered first of all as decorative and are grown up in rooms. Pepper is used in food on reaching a so-called technical maturity of fruits — they have to be slightly immature. • Requirements to the soil. Loamy soils with neutral reaction are preferable, are admissible — with subacidic reaction. The others need melioration. • Requirements to humidity. Hygrophilous culture, in droughty areas is required irrigation. • Requirements to light. The photophilous plant, best of all grows on the sites which are well lit with the sun. • Cultivation temperatures. Thermophilic culture, badly transfers wind — in the open ground can be only in the places which are well protected from wind. Does not suffer frosts. Seeds sprout at a temperature from +15 "Page. • Geographical restrictions at cultivation on zones and regions. By origin pepper — a tropical plant (the homeland — America) therefore completely in the open ground it can be cultivated only in the few areas. 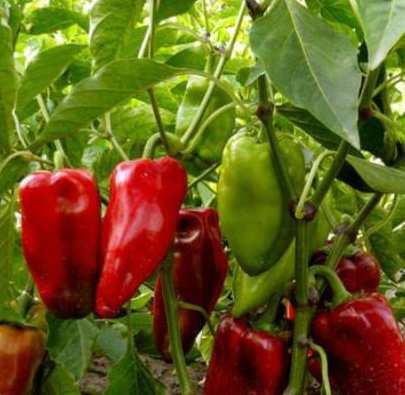 Already in Donbass pepper is grown up only in the rassadny way. However as the culture of the closed soil pepper, especially bitter, has much wider geography. Some grades are grown up in the closed winter greenhouses all season. Enough the room culture of decorative hot pepper at which climatic conditions cease to play an important role was widely adopted. There is a large number of grades of pepper, especially sweet. Because it is the culture of mainly closed soil (where it is told about the open ground, the possibility of jumping of seedling in it at the end of May — the beginning of June is meant, other grades can contain in the greenhouse or in the film shelter and in the summer), an opportunity to cultivate pepper in greenhouses plays nearly a large role, than division into districts. The factor defining for successful cultivation is duration of the vegetative period (maturing terms) of this or that grade in comparison with duration warm (with temperatures not below 10 — 15 °C), but not just bezmorozny period in your area.